The studio is equipped with a 5-piece Canwood/Yamaha drum kit, Hammond M3 organ and 147 Leslie rotary speaker, 5-guitars, 2-guitar amps, 2-keyboards, 2 sound modules, and various percussion instruments. 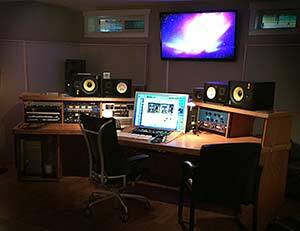 The studio rooms are acoustically treated with Sonex acoustic foam, 3 different custom built oak sound diffusers. The control rooms are treated with Sonex acoustic foam and custom built oak diffuser/absorber panels throughout each control room.